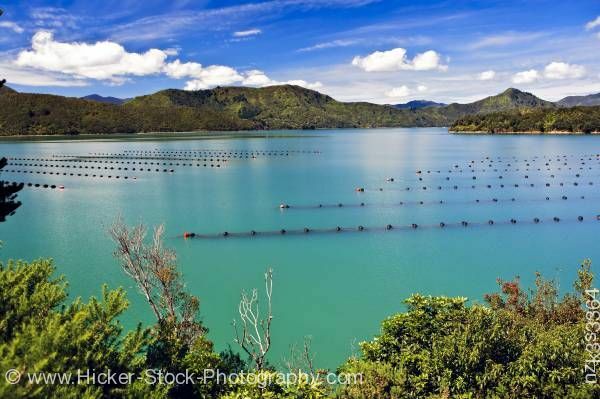 Stock photo of Mussel Farm in Kenepuru Sound near Waitaria in Waitaria Bay, Marlborough, South Island, New Zealand. Mussel Farm in Kenepuru Sound near Waitaria in Waitaria Bay, Marlborough, South Island, New Zealand. This stock photo shows the rows of ropes of a mussel farm in the Kenepuru Sound near Waitaria in Waitaria Bay, Marlborough, South Island, New Zealand. Through lush green brush, along the shores of the Kenepuru Sound is a beautiful view of the Waitaria Bay. The bright green and blue waters of the bay have long straight rows of nets and buoys for the mussel farm. In the distance is a beautiful view of the Kenepuru Sound as the Waitaria Bay flows through the rugged mountains. A wonderful bright blue sky with soft puffy clouds intermingled with soft wisps of clouds add to the awesome view of the Kenepuru Sound. In New Zealand, the mussel farms also known as aquaculture is a way to cultivate mussels, salmon and oysters.